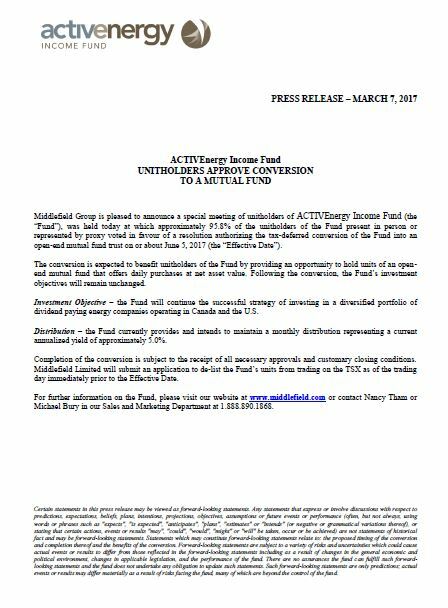 ACTIVEnergy Income Fund invests in a diversified portfolio of dividend paying energy companies operating in Canada and the U.S. To provide further diversification, the Fund also invests in oil and gas exploration and development companies as well as oil sands common stocks. Assisted by the research of our Special Advisor, Groppe, Long and Littell of Houston, Texas, we remain very positive on the oil and gas sector and continue to hold the view that global oil and North American natural gas production has peaked. The Fund maintains an exposure to oil and gas companies that possess high quality assets, attractive yields, low payout ratios, modest levels of third party debt, proven management teams and the ability to build value through internal operations. 3. Crescent Point Energy Corp.
6. PEYTO Exploration & Development Corp.